Exploring how parental control requests between parent/guardian and teens can be carried out in a way that matches the tone and experience of the app. Tale is a fictional augmented reality story-sharing and messaging mobile application which connects people to ephemeral media created by people or other entities near them. Facial recognition technology to provide filters and augmented reality effects. The faces captured are used to train the Tale algorithm. Background location is used and to store a record of places you frequently visit to enable them to notify you of custom AR content available nearby. Tale content is visible for 24 hours and is shared with the group you select for each post. The type of content that can be shared can be set via parental/guardian controls. Privacy and control for teens is as much about agreements between parent/guardian and teen as it is between the service provider and the teen. Permissions may evolve over time, and be granted or withheld in certain situations until they have reached a certain age. Technology should be able to help facilitate this evolution in a way that is meaningful and flowing to both parent/guardian and teen. ...mediate the evolving nature of permissions between parent and teen in a way that is engaging to both groups? In this example, the user has not yet received permission to post photos of themselves with others on the platform. 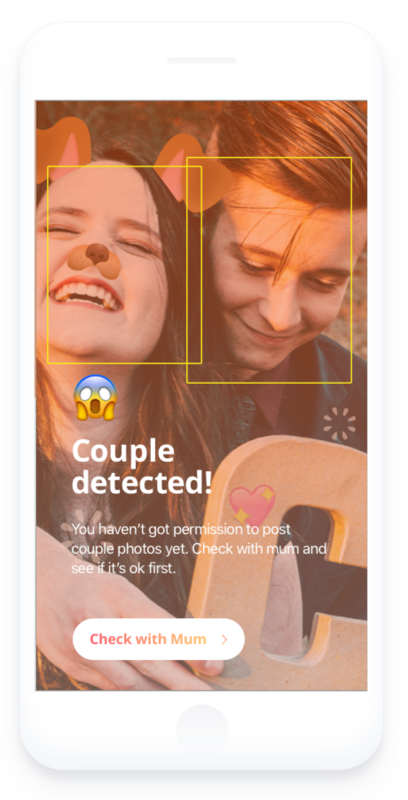 As a result, Tale communicates this restriction at the time of attempting to post the photo in a playful way, and adding some humour into the moment that is in keeping with the overall tone of the app itself. The app allows the user to send the photo that they are attempting to post to a parent or guardian to ask for permission to post it. In this example, the user is able to use the existing Tale tools to create a personalised request to the parent in a way that encourages light-hearted communication between parent and child. Explore how the user could see all the restrictions and their statuses? Explore the parent’s view – how do they receive this request and how can they also respond in a playful way if they would like to?